The Northern Circuit Route is the newest route on Kilimanjaro. This is a unique itinerary in that it is the only route that visits the northern slopes, while traversing around nearly the entire mountain. The Northern Circuit is also the longest route on the mountain, in distance and time, making it a difficult route. 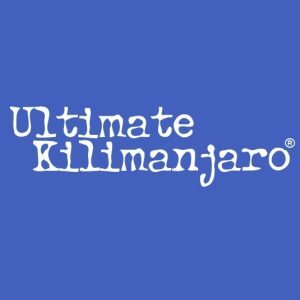 However, it has the best acclimatization profile which makes it the route with the highest success rate as well. 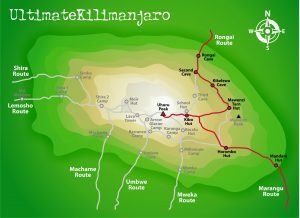 Below is a map of the Northern Circuit route on Kilimanjaro. The Northern Circuit route is a 9 day route. The path begins west of the peak, on the same trail as the Lemosho route. Once climbers reach Lava Tower, the route heads north west to Moir Hut, circling the mountain clockwise at an altitude of approximately 13,000 feet. 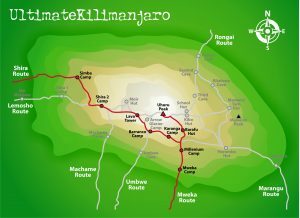 This path then intersects with the Rongai route variant at Third Cave, beforing summiting from School Hut. The descent is down Mweka. 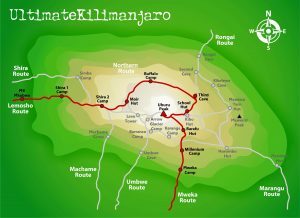 The Northern Circuit route is easily one of the best routes on Kilimanjaro. It is best suited for those who enjoy backpacking for many days, and want to do something that is different. The Northern Circuit is also preferred by those who want to get away from other travellers while on their trek.